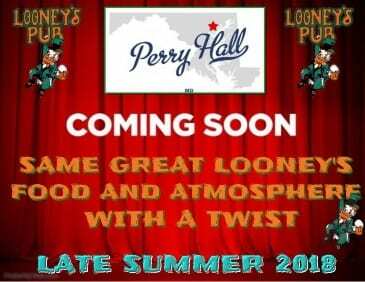 After much anticipation, Looney’s Pub Perry Hall has revealed when it will open to the public. The new location will open on Wednesday, October 3, 2018 at 11 a.m.
Normal operating hours will be 11 a.m. to 2 a.m., with the kitchen open until 1 a.m. daily. The new Looney’s Pub is located at 8706 Belair Road in the space formerly occupied by The Harp.